The RedSeaMobile started with a fantasy that possessed professor Mel Rosenberg. Is his fantasy professor Mel Rosenberg envisioned himself water skiing on land. After brain storming with Hagai Cohen it was clear that the engine pulling the rider in this case he is roller blades could be any engine or electrical motor, but the stirring mechanism should be something unique. The end product was a two, push pull rods linked to three way mechanisms. The reciprocate movement of the push rods controls the stirring. The right rod swivel action control the accelerator and the left hand handle controls the brakes. In the video you can see Mel (in his fifties) using the RedSeaMobil in relative ease but in somewhat reserved manner which is acceptable to his age and skating experience. 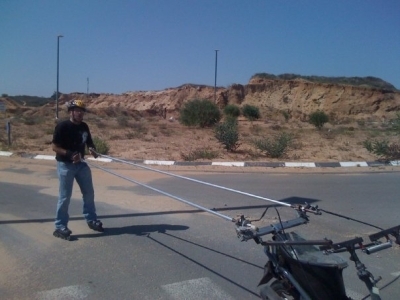 As the rods may move parallel laterally, the rider may control the vehicle traveling parallel to the track the vehicle travels, as the water skier does. The inventor of the stirring mechanism Mr. Hagai Cohen was not proficient on roller blades, he built a platform to which he attached a chair. 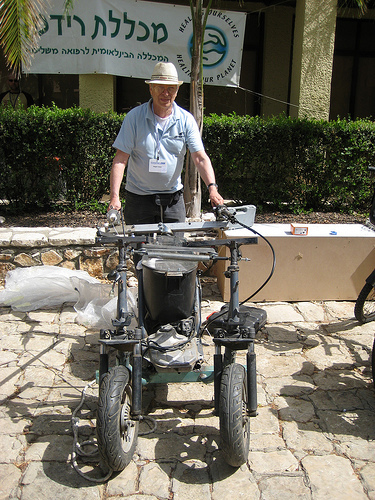 The new device was called Moses chariot and was used to test run the vehicle. The stirring mechanism has a centering geometry providing the necessary 'feel' to the rider thus making the vehicle ride accurate. But no doubt challenging. 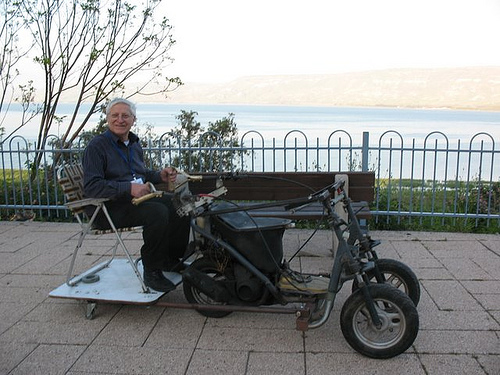 A year later, Hagai improved the RedSeaMobile into a Mad Max kind of vehicle, named Moses Cradle.